I can't believe what I found! Several meters below the surface was the remains of a lab. Although most of the lab was damaged, I did manage to find papers that indicate that it belonged to the famous robot designer, Dr. Thomas Light. I've begun to review what is left of Dr. Light's notes and it looks like he was onto a major breakthrough. Today I met "Mega Man X". Not simply a robot, Mega Man X is something totally different. Light has given him the ability to think and make his own decisions. At times, Mega Man X seems more like a man than like a machine. With Mega Man X's help I have completed my first "Reploid". Although I don't completely understand how all of Dr. Light's systems work, I was able to make some minor modifications and the Reploid seems to be functioning perfectly. His strength and intelligence seem limitless and he is fully able to make his own decisions. In fact, we got into our first argument. How intriguing! The new reploids have been running off the assembly line for several weeks. It's amazing how easily they have been able to adapt to even the most difficult jobs. It still is a bit odd to see them working side by side with humans, but everyone seems to be happy to accept them. The council has now decided to set up a group of "Hunters" to destroy any maverick before it can cause injury. The reploid named Sigma has been assigned to lead the Hunters. Sigma is one of the most intelligent reploids I've created and contains my latest circuit designs. His systems should be immune to any problems. My worst nightmare has just come true. Sigma went maverick today and took most of the other hunters with him. His motives are unclear, but it seems that he "decided" that humans are inferior and limiting the growth of the Reploids. For that reason, he decided that all humans should be eradicated. Most of the population is in hiding or trying to flee the city. I'm not sure how long we can hold out against Sigma's forces. I fear I have built the Reploids too well. --From the SNES Mega Man X instruction manual. Play Mega Man X Now! to master. Like most Mega Man games there were plenty of secrets to find and lots of weapons to gain (from the sub-bosses of course). This was also the first game that had Zero. Zero is another robot based on Mega Man X's design who helps in certain parts of the game. 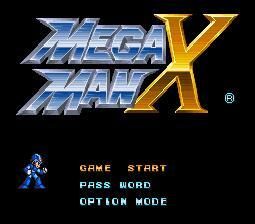 Any Mega Man fan should certainly play this game in the series along with Mega Man X 2 & 3. Like most Mega Man games you must lead Mega Man through many sub boss levels in order to get to the head boss. In Mega Man X it is no different.